This week, students from The Refugee Action Committee (RAC) and Students Against Sexual Assault (SASA) at Gettysburg College are co-sponsoring a fundraiser to benefit Project Gaia and the Former Women Fuel Carriers Association in Addis Ababa, Ethiopia. These beautiful, hand-loomed scarves are available in a variety of patterns and a rainbow of colors for only $15.00 each. These make wonderful presents for family, friends — or just for yourself! WHEN: Monday, December 5th – Friday, December 9th, 11:30 a.m. to 1 p.m. The FWFCA or The Former Women Fuel Wood Carriers Association is an organization devoted to bettering the lives of Ethiopian women who previously worked as “fuel wood carriers” – women who manually cut down trees outside the city of Addis Ababa, carried the wood into the marketplaces of the city, and sold each day’s load for less than $1.00. 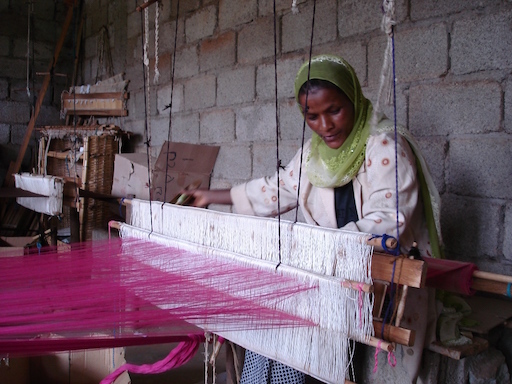 The FWFCA provides women with an alternate source of income by teaching valuable skills like weaving. Please watch two of our videos – Both were filmed on site by Jake Boritt, an award-winning Gettysburg and Harlem based filmmaker.